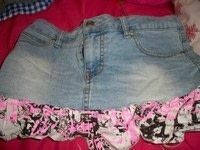 revamp old denim skirts to cute new ones!! 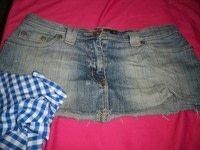 https://www.cutoutandkeep.net/projects/cute-summer-skirts • Posted by flissy e.
hey this is my first how to, very excited!! im sure lots of you have done this before but i love it!! 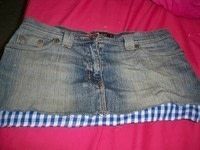 its pretty easy and gives a totally new look depending on the fabric you use. here ive shown a farmer style gingham one and pictured also is my rock skull and bones one, hope you like!! 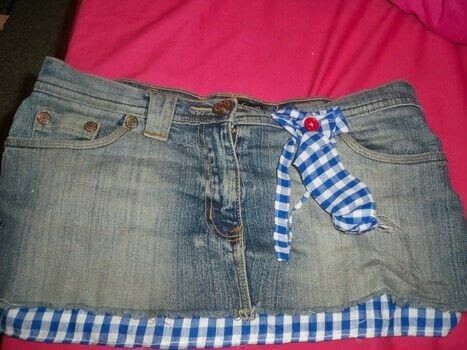 so first off you need a old denim skirt thats boring you, and some material that you like, ive used gingham . you just need enough to make a strip that fits round the bottom of the skirt, same thickness all the way round. 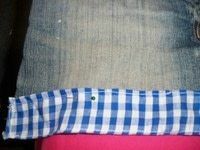 (using a checked fabric does make it easier to keep in line, so for a first try id go for that!!) 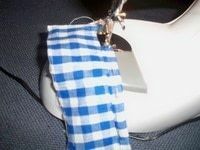 make it wider than you would like the length as you will need to put a hem on. 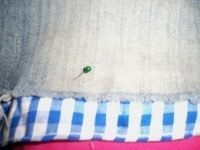 make a hem along the length and edges of the width.. however if you want the edge that is showing underneath the denium skirt to be rugged and frayed then you dont have to hem that side. .... this one i pinned underneath so that you can see the fray on the denim which i personally like, you can see the stitching more though this way. so now sew that on, use a colour thread that goes with your material or not if you want it to stand out...woteves its your thing!! next go a little crazy and add some decor!! that can be buttons, gems etc. for this one i made a flower out of the scrap material left by just bunching and folding it pretty messily into something i liked, put a little stitch in it then added a red button as the centre piece. i added to the flower ribbon legs which i left all frayed and then sewed it to the skirt, or you can pin if you dont want a permanent thing!! and dah dah skirt complete!! with the skull and bones one pictured i added little folds all the way round to create a pleat for a different effect. you really can go wild with this basic idea, add more than one layer, just experiment. 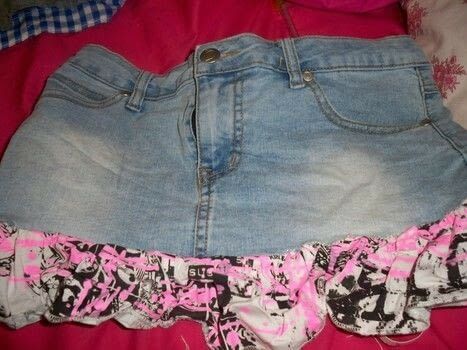 i now have no plain denim skirts in my wardrobe ha ha.